The Dangaria Kandhas , a Particularly Vulnerable Tribe Group live in the terrains of Niyamagiri hill ranges in Rayagada and Kalahandi district covering 4 (four) Blocks those are Bissamcuttack, Muniguda and Kalyan Singpur of Rayagada District and some parts of Lanjigarh block in Kalahandi District. They speak in “Kui” a Dravidian Dialect. They are expert in Horticulture and practice shifting cultivation. They grow pine apple, banana, oranges, turmeric, zinger and variety of cereals, millets and pulses in their swiddens. They have their linear housing pattern in the Dravidian style. They live in being organized in to a strong territorial clan groups. They follow clan exogamy and practice polygamy. The Girls’ Dormitory is a unique feature of this tribe. They observe “Meria” festival sacrificing buffaloes. They worship Earth Goddess (Dharanipenu and Kuteiwali). The worships observed in “Sadar” the community house of the village. 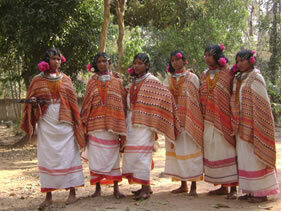 The Dangaria Kandha is one of the feuding tribes of India. 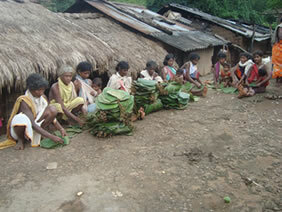 Their main occupation is cultivation in Dangar lands and plantation of different fruit bearing plants.